Easily one of the most important parts of creating a studio or home theater is your setup. The improper placement of speakers can impact your listening experience and not give you the full scope of the power of your equipment. With something as simple as the On-Stage SMS6000 Studio Monitor Stand, you can transform the power of your audio equipment. Additionally, you’ll be able to have a clean and sleek way to display your speakers where they’re out of the way. With plenty to offer, the On-Stage SMS6000 Studio Monitor Stand is easily one of the better stands for speakers that currently out on the market. There are several purposes to this monitor stand. The two most notable are that it gives you the opportunity to create a 3D sound experience. What’s more, they’re a reliable place for storing your speakers. There are plenty of homeowners who aren’t interested in installing their speakers on the wall. In fact, many are not able to because of the type of speakers that they own. A fantastic alternative is to use a couple of studio monitor stands. When it comes to professional or at-home studios, it’s far simpler to use stands. They give you the opportunity to set up the speakers absolutely anywhere without a complicated installation process. They also make it easier to take the speakers down and store them when necessary. The On-Stage SMS6000 Studio Monitor Stand is designed to make it much simpler to create your very own authentic listening environment. Whether you’re developing a new track or watching your favorite film, you’ll have full control over where the sound is placed in a room. Who Is This Studio Monitor Stand Meant For? Anyone who is interested in creating an at-home theater or a professional sound studio will be able to benefit from using the On-Stage SMS6000 Studio Monitor Stand. It is very intuitively designed and user-friendly with plenty of customizable features. If you’ve owned lesser quality monitor stands in the past, you know how difficult it can be to use them with speakers. The speakers might wobble on the top of the stands, the feet might be poorly balanced, and the overall build quality will be lackluster. This stand is built with high attention to detail, making it much easier to set up and take down. There aren’t very many accessories that you’ll need when it comes to setting up the On-Stage SMS6000 Studio Monitor Stand. This is because each stand is designed to have all of the features built into the column and top of the stand. There are several different heights that you can choose to set the On-Stage SMS6000 Studio Monitor Stand at. The columns are fully adjustable from 36.5 to 54 inches, and you can lock the stands into position every four inches. You’ll also be pleased to know that each stand is rated to hold up to 90 pounds. To help make the installation of your speakers simpler, each platform features a non-slip pad that is one millimeter thick. This creates a more low-profile housing while also ensuring that your speakers will stay in place once they are put on the stands. Once you have chosen the desired height for each column, you can then use the pin locking technology to keep the stands in place. With this feature, you won’t have to worry about the column suddenly dropping or damaging your speakers. It’s simple to assume that not every floor is going to be entirely even. With that said, this studio monitor stand was designed to feature three different leveling spikes on the triangular base. This gives you the ability to adjust each spike so that the monitor stand sits firmly on the ground. Additionally, the spikes make it easier to use and set up this studio monitor stand on a carpet. 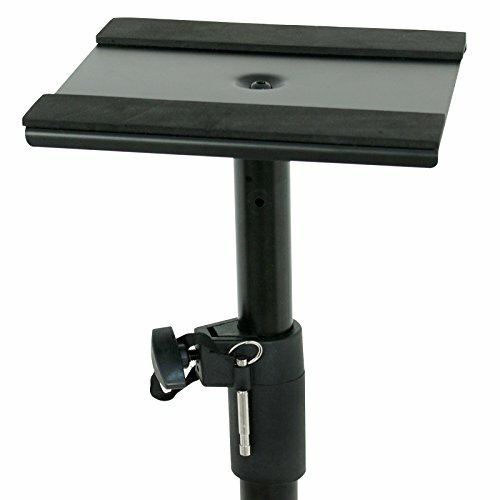 As mentioned, the On-Stage SMS6000 Studio Monitor Stand is designed with everyday use in mind. You’ll appreciate how it’s constructed out of steel, which adds to its durability and longevity. Unlike other studio monitor stands that arrive in one piece, you will have to assemble this stand. However, this also makes it substantially easier to store as every part can be disassembled. Using the On-Stage SMS6000 Studio Monitor Stand is quite simple, especially as the assembly instructions are all written on a single page. It’s highly recommended that you test out several positions once you have your speakers installed to have the most immersive experience. Once assembled, you can place your speakers on the anti-slip pad on the platform and ensure that they are stable. It’s recommended that you find the correct height for the stand prior to adding the speakers. Next, you can then place the stand around your room based on where you want the sound to be. 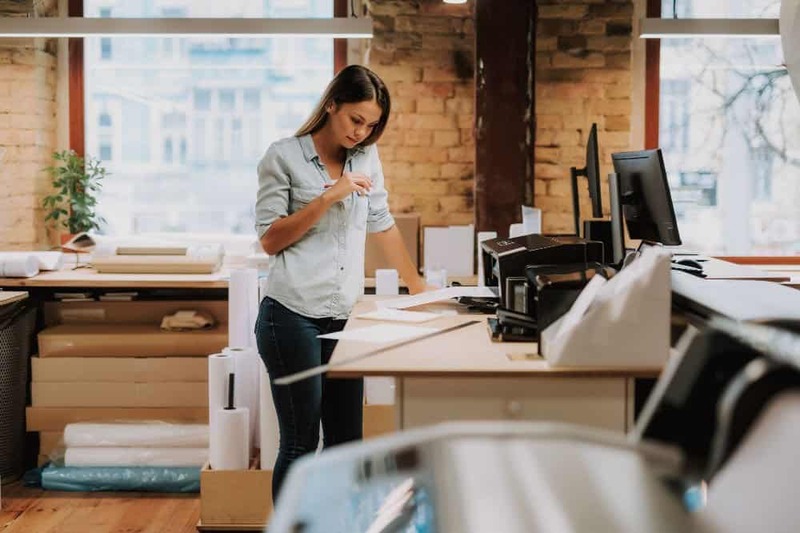 You may also want to consider sliding the bottom of the stand under furniture, so it doesn’t impede high-traffic areas. As another tip, ensure that you use the featured leveling spikes on the carpet. They are specifically designed to grab into the fibers so that the stand doesn’t wobble. 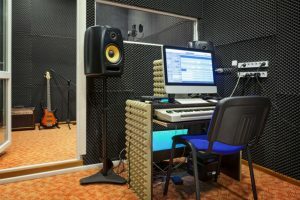 One quick search online and you can guarantee that there is plenty of different stands for studios to choose from. With that said, our favorite alternative to the On-Stage SMS6000 Studio Monitor Stand is the ZENY Studio Monitor Speaker Stands. 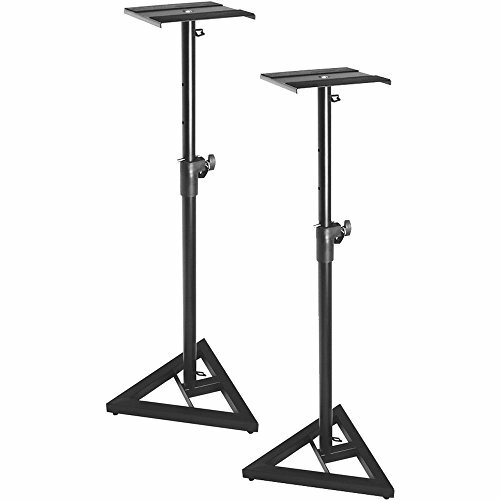 Compared to the On-Stage stands, which can hold up to 90 pounds, the ZENY monitor stands can handle up to 110 pounds individually. This is highly recommended if you own heavier speakers or want a higher maximum weight threshold. Instead of using typical pin locking technology, the ZENY Studio Monitor Speaker Stands have a security knob that allows you to lock it into your desired height. If you’re looking for a low-profile speaker stand, the On-Stage SMS6000 Studio Monitor Stand is one of the best options you’ll find. Constructed entirely out of steel with several different height adjustments to choose from, this studio monitor stand has everything you need. With the built-in pin locking technology and anti-slip mats on the platforms, it is clear to see that the On-Stage SMS6000 Studio Monitor Stand is designed for every type of speaker.